Misty's Musings: Could I Embarrass Myself Any More??? I can NOT believe I'm doing this. Oh my gosh, this is SO embarrassing! However, two of my best friends asked me to post these, and, if you know anything about me by now (other than my passion for photography and my excessive habit of rambling), you know that I do everything in my power to NEVER disappoint my friends. So... without further delay (because I might chicken out due to MAJOR embarrassment), I post, for my very dear friend Bear (and additional nagging encouragement from Tammy), the photos of Misty-Big-Hair-Stage and Misty-Poofy (shup Barb hehe)-Hair-Stage... then, I'm running to hide in a cave somewhere! OK - the Big-Hair-Stage... Say it with me now... "Tease that hair!" And... the Poofy-Hair-Stage... was this really "Cool"??? PLEASE tell me y'all did this too... you did, didn't you? 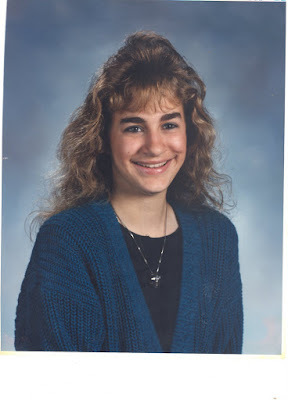 Holy crap... why didn't someone ever hold me down and pluck those caterpillars called eyebrows? Oh wait - someone did... when I was about 7 years old, and that's when I cried, rebelled, and swore I would never, ever pluck my eyebrows... then, I got married, and wanted to look 'pretty' and ... well, now I've tamed the caterpillars! OK! That's IT! I'm DONE! NO more embarrassing "Misty was a complete dork" pics! No way... no more! Oh, and by the way, I'm pretty sure these were not taken with a Nokia N810. In fact, I'm pretty certain they weren't even thought of yet! It's not as poofy as I thought, alright so maybe it's a little poofy, alright a lot poofy, but we ALL had poofy hair in the 80's!!! Man you were always HOT!!! I agree with Tammy, you're a hottie, for sure! 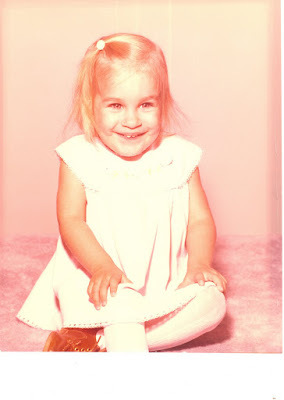 You and my little sister, Antoinette, could so totally be twins. Really! What class? Class of 90? Obviously you were a child of the 80's and I believe that big poofy hair was a requirement then. Now, if you want to embarrass yourself even more you could certainly do so by posting nekkid baby pictures or something along those lines! Thank goodness there are none of those in existence from my childhood but some people do have them, right?? Ah, big hair! Love it! That hair is nothing, Misty. You should have been around during the late 60s. Now that was "BIG HAIR" days! Hi Mis..ss..ss..ty. Wou...ou..ou..ld you l..l..l..i...Aww, forget it. The BIG hair is lovely! and you were such a cute little 'un with your chubby cheeks! LMAO at caterpiller comments. You were such a cute little girl. 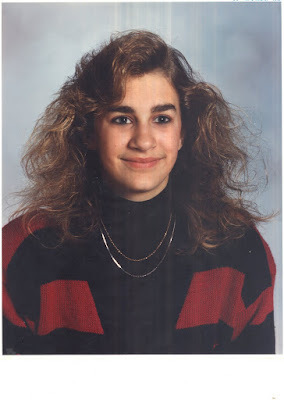 Yes we all went through high school but some people never really had a big hair year(me). Miss you. Hugs. You have such a gorgeous smile - genuine and infectious! The poofy hair to me is like the big hair - just a stage. So, obviously, there has NEVER been a time when your magical smile and enchanting eyes were not bringing happiness to your world. I knew that! You continue to bless me Spirit with all that you are. And I do, so very much, appreciate and enjoy you. Good one - even better your smile! Misty: Sorry, I never poofed my hair, but I did have the Elvis sideburns and the DA. How great a post. All I cam say is thank the lord for straightners. We were all there, we can't deny it. Oh Misty Dawn...you remind me of Julia Roberts!! you looked great! Thanks for posting those, Misty!